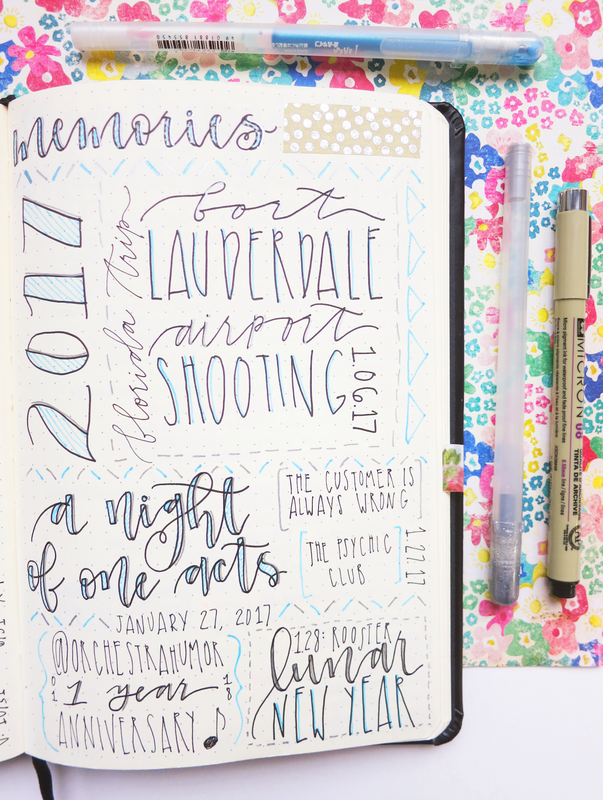 Due to some circumstances discussed in January's setup (link in above paragraph), I didn't use my bujo for about a week and a half. 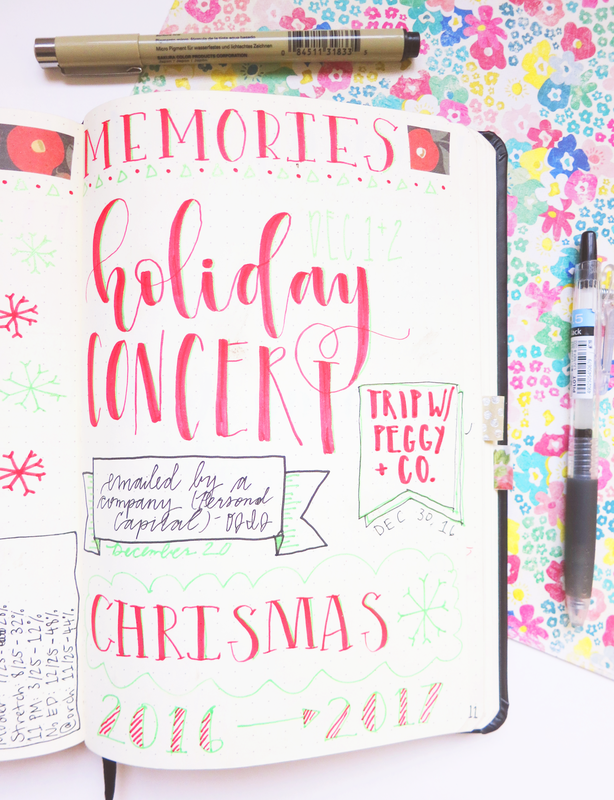 In that time period, I used a random journal that I have as a temporary bullet journal until I could transition back into my real one, and those days are marked with an X. If that's something you'd want a full post about, let me know by leaving a comment! This is my monthly spread for February. 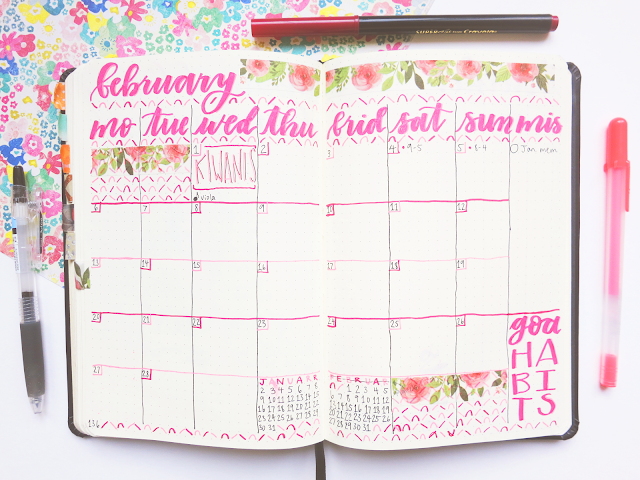 I went with a pink-ish color scheme in honor of Valentine's Day (even though I think it's a completely overrated holiday, and I'm always single during it lol). The darker color is actually just a normal Crayola Super Tip marker, though I used the Kuretake Zig Wink of Stella clear brush pen to make it all sparkly, which you can't really see in the pictuers :(, and I used a Sakura Moonlight Gelly Roll to accentuate the downstrokes (though you can't see it either). I got the former really recently, but I wholly recommend it because it's just such an amazing thing to use. If you're wondering, the "mis" stands for "miscellaneous," which holds random tasks and notes throughout the month, and "goa" stands for "goals," which is a space to write down big, general objectives that I want to keep in mind throughout the entire month. Last month, I implemented goals into my habit tracker layout. I hoped that it would help me be more accountable with each individual habit since I've kind of been failing them in the last couple of months. As you can see, I fell short of my goal for almost every item. I also did worse with many of January's habits compared to December's, so I'm really disappointed with that. 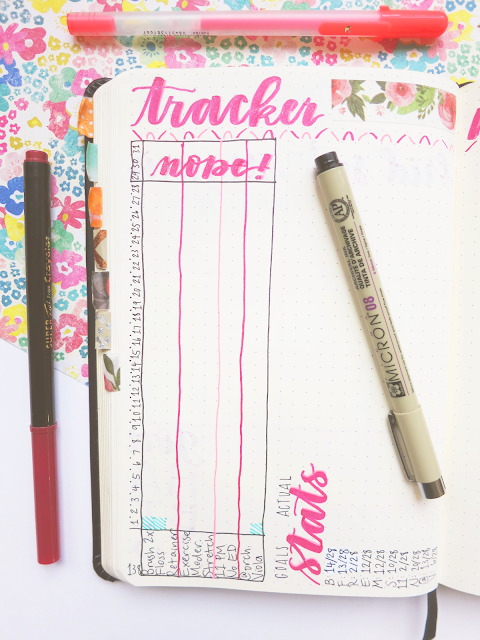 This is February's tracker, and I also set new goals for each habit. I hope I do better this month! To help with that, I think I'm going to try to check in each week and see how I'm doing. I also forgot that February only has 28 days . . . 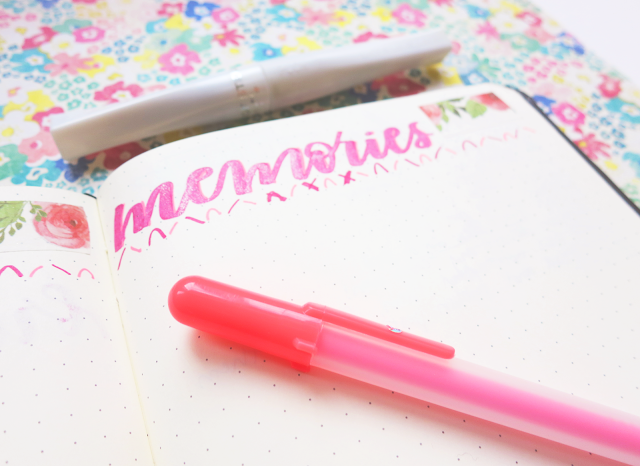 I got the memories spreads in my bullet journal for December and January done, so now I'm all caught up! I'm actually really quite proud with how January's turned out. This is the blank monthly memories layout for February. I messed up the border a lot . . . In January, I'm finally getting out of the dailies slump that I'd been in for the past 2 months-ish. In November and December, I skipped SO many days of dailies, but thanks to the forgiving nature of the bullet journal system, it doesn't really matter. I was pretty good with doing daily spreads in January, but since I used a temporary bujo for a big part of the month, I still didn't use that many pages. I'm now actually a little concerned that I might run out of space in the index before I run out of pages in ths bullet journal. 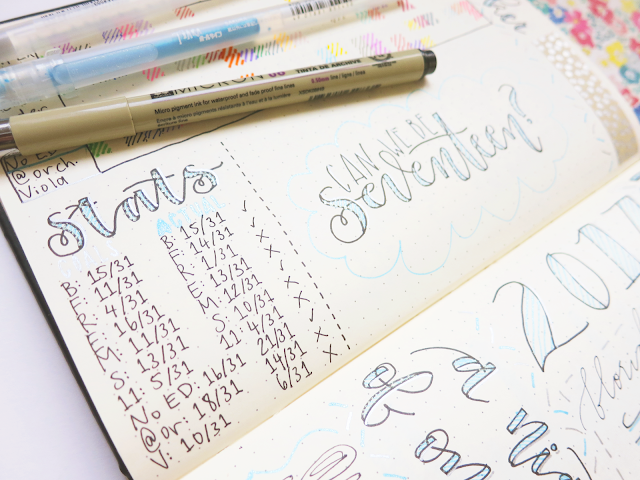 February is my 7th month in this notebook, so I also need to set up a new future log ASAP. 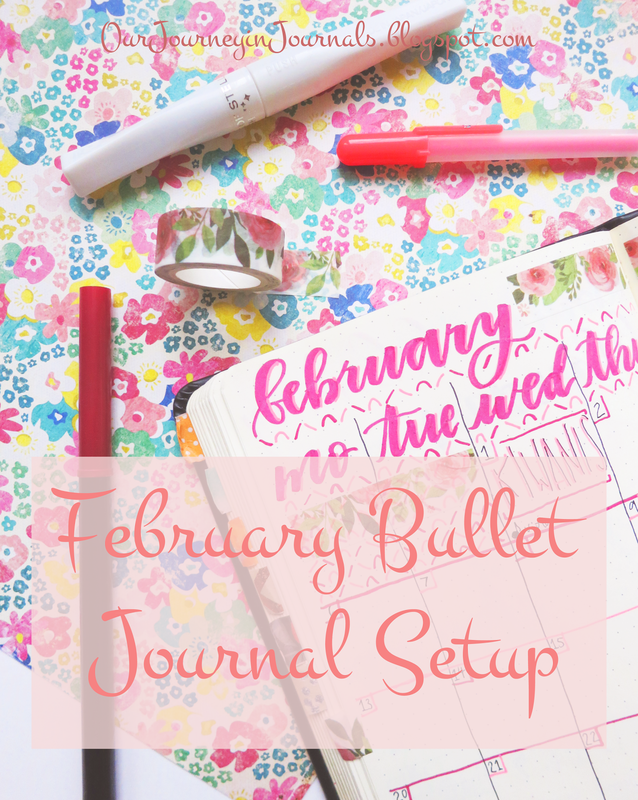 That is it for my February bullet journal setup! 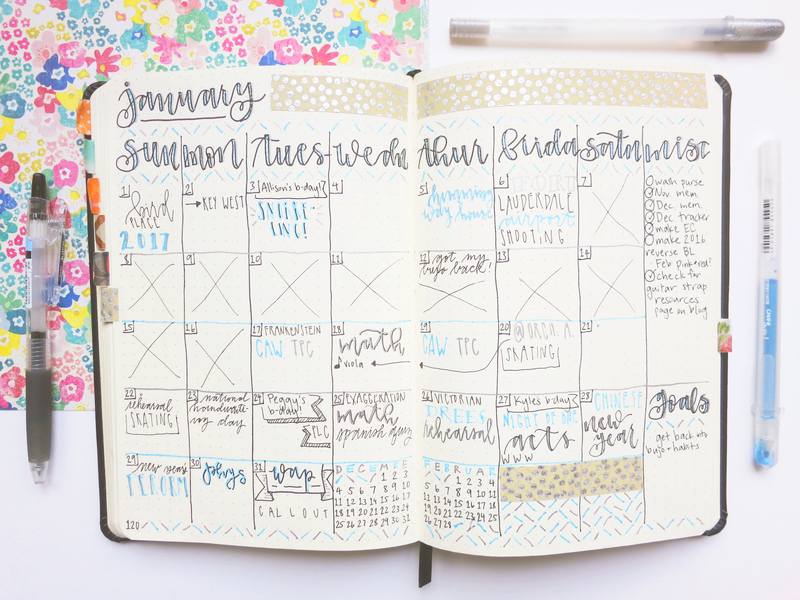 Overall, it's mostly the same as I've been setting up my bujo for the past couple of months. What was February's setup like in your bujo? Tell me in a comment down below!